John Conyers and the World Peace Council. 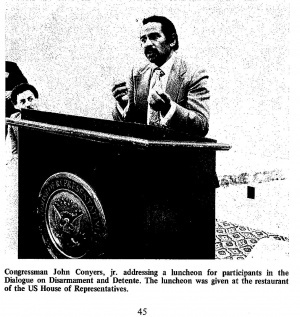 For many years John Conyers, Jr. was linked to Soviet front World Peace Council. The WPC delegates were guests of a number of members of Congress at a luncheon in the House of Representatives' dining room, and at a reception. Among those present were several members of the Congressional Black Caucus,including Congressman John Conyers (Democrat of Michigan), Congressman Ronald Dellums (Democrat of California), Congressman Ralph Metcalfe (Democrat of Illinois) and others. Congressman Philip Burton (Democrat of California), House majority leader, joined the luncheon, expressing interest in the work of the WPC and the New Stockholm Campaign. The delegation was also able to speak with a few members of the Senate and House Foreign Relations Committees and the Armed Services Committees, including Congressman Paul Findley, Senator Briscoe, ranking Democrat on the Armed Services Committee, and Senator Thomas McIntyre. In 1978 Congressmen John Burton, Ted Weiss, Ron Dellums, John Conyers, Don Edwards, Charles Rangel and others... attendeda World Peace Council organized meeting on Capitol Hill. The WPC delegation, was led by its President, Romesh Chandra, a member of the Communist Party of India. Conyers welcomed this group, saying "You have joined us to give courage and inspiration in our fight for disarmament and against the neutron bomb." WPC delegation members included KGB Colonel Radomir Bogdanov and Oleg Kharkhardin of the Communist Party of the Soviet Union International Department. In 1981 another World Peace Council delegation led by Romesh Chandra toured the U.S. to publicize the "nuclear freeze" then being promoted by Leonid Brezhnev. This group met with several Congressmen at the Capitol, including John Conyers, George Crockett, Ron Dellums, Don Edwards, and other Democrats. These Democratic Congressmen made House offices available for meetings with the WPC delegates. During one of the meetings in these Congressmen's offices an official of the Communist Party USA was present and made a speech recommending that the "peace movement" unite in supporting the cause of several terrorist groups including the PLO and the Communist guerillas in EI Salvador. Conyers has consistently voted against every new U.S. weapons program and opposed the defense budgets. The American Security Council rated him at 0% for 1988. 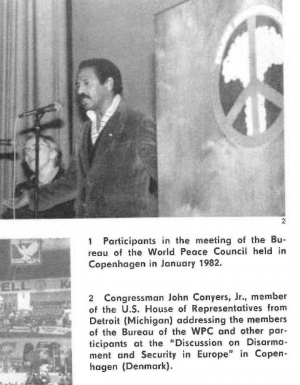 In January 1982 Conyers addressed a World Peace Council Bureau meeting "Discussions on Disarmament and the Security in Europe" in Copenhagen, Denmark. On the weekend of November 12-13, 1979, the Communist Party USA front U.S. Peace Council was established in a meeting at International House on the campus of the University of Pennsylvania, Philadelphia. US rep. John Conyers twice addressed the conference. This page was last modified on 17 November 2014, at 00:04.